Black tape for a blue girl – legends of the Neo-Classical / Heavenly Voices / Darkwave scene – have their first Russian best of courtesy of Shadowplay Records. Featuring music from all eras of their career, A Retrospective presents the most popular tracks from the band’s nine full-length releases. Sam selected the songs (with audience input) to please recent fans of vocalists Elysabeth and Bret (from The Scavenger Bride and Halo Star) as well as those who go back to the 80’s and 90’s with Oscar’s vocals. The older tracks were remastered, giving them renewed power, sonic depth and presence. To make this release special for “the fan who has everything,” Sam picked alternative mixes of many songs including three re-recordings with current members (“Remnants of a Deeper Purity”,” “Overwhelmed, beneath me” and the previously unreleased version of “I have no more answers” with Elysabeth on vocals). 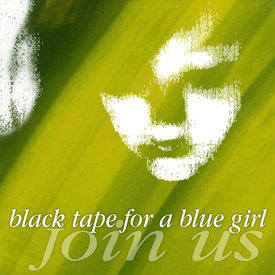 The 2007 version of Black tape for a blue girl’s 1989 classic “Across a thousand blades” was remixed for the Projekt200 compilations, this is the first appearance on a Blacktape album.